Coffeeneuring, randonneuring, a fatbike, snow, a Salsa Casseroll, a dog, some moose, and a newly completed trail project. That’s just some of what awaits you in this fine post from Tom D., a first-time coffeeneur who has had a big year of riding in 2013, including the 1400K London Edinburgh London (LEL) earlier this year. It’s a perfect pre-holidays story. Thank you, Tom, for guest-posting today! After reading about and seeing pictures of the last two coffeeneuring challenges, I decided that I should take the plunge this year. But I did not just jump in blindly, I sought advice and inspiration from fellow Alaskan Randonneur and coffeeneuring ancien, Ted T.
I have to say that I enjoyed the challenge. It got me out riding a few times when I might otherwise have driven, or even just stayed at home. Thanks, MG, for putting this together. Before I get to the rides, here is some preliminary information. The first five rides were done on my Salsa Casseroll, a fine and trustworthy, if not particularly glamorous, ride. This bike has seen me through many brevets, and my first grand randonnee this summer—London-Edinburgh-London. The Salsa Casseroll is outfitted in standard rando style with bigger than average tires, a dynohub and light. I took off the fenders and bags for the trip back from London, and never got around to putting them back on. Also, my bike computer battery died somewhere around Pocklington on the way back to London, and since then I have enjoyed riding completely undistracted by data. I will probably put in a new battery next summer sometime, but in the meantime all mileage distances are approximate, except for Ride #6, as explained below. The last two rides were on my Fatback—a mountain bike on steroids with 4-inch wide tires designed for snowy winter riding. Alas, it is a few years old, and the newest generation of monster truck sized tires won’t fit on it. And, before I get to describing the coffee rides, I want say thank you to MG for teaching me everything I know about riding a tandem. After LEL, my wife and I visited France. We were staying in the Loire Valley, and we did not want to rent a car, but we did want to visit some Chateaus that were 20 or so kilometers away. 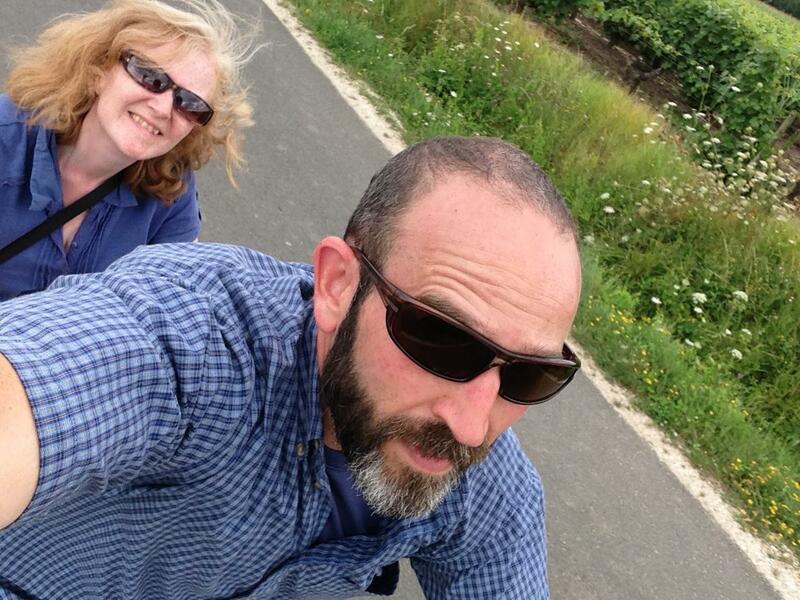 My wife does not ride much, and was concerned that if we rented bikes I would get frustrated with her pace. But, I convinced her that if we rented a tandem, that would not be a problem. And, solely from reading Chasing Mailboxes, I knew enough to do a persuasive impersonation of someone who actually knew something about riding a tandem. The first kilometer or so was a bit wobbly, but after that it was smooth sailing! We are now shopping for a tandem of our own. Now for the actual rides. 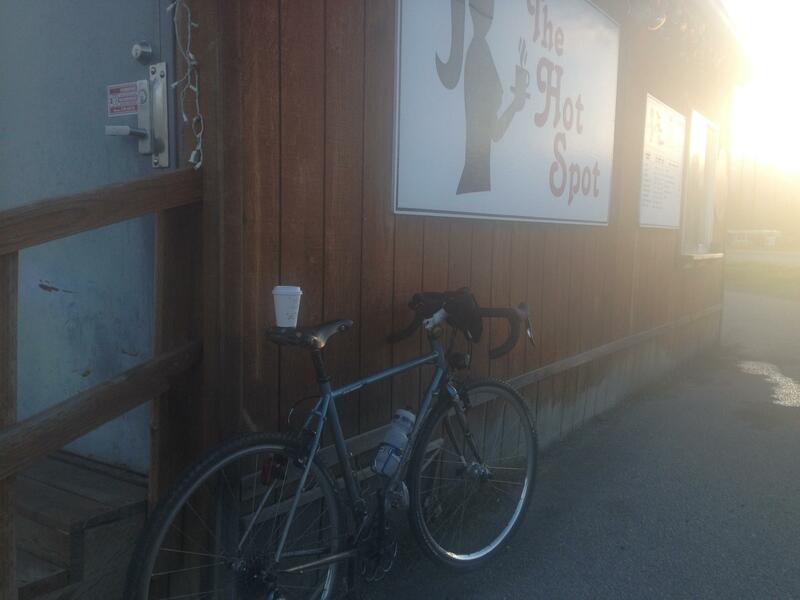 Coffeeneuring Ride #1. A Meetup with Ted T.
When you posted the challenge this year I sent a message to Ted T., and asked if he was up for coffeeneuring this year, and if he wanted to meet for a cup of coffee. He was and he did. 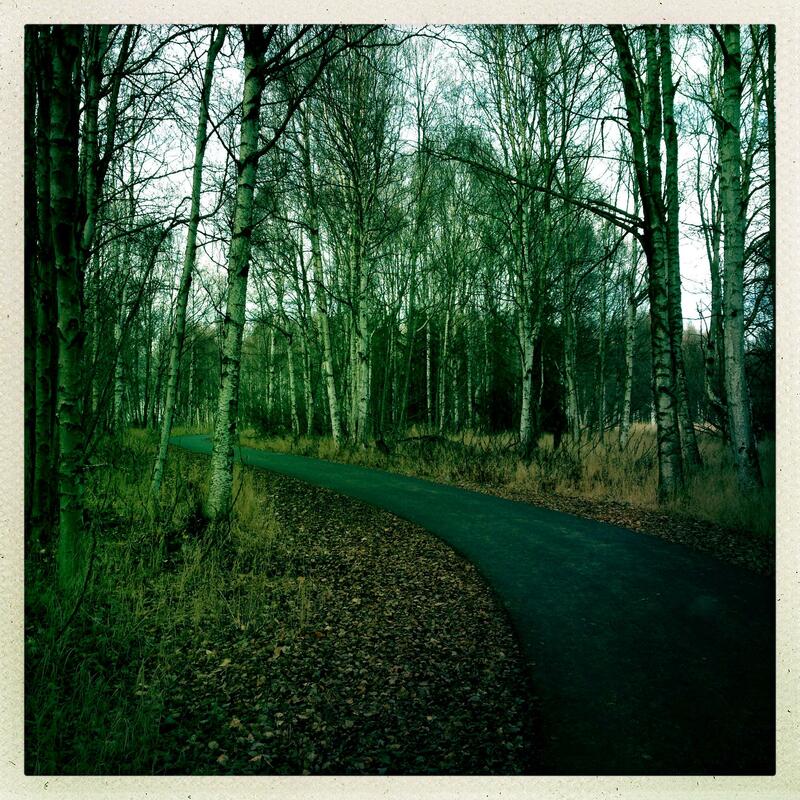 Ted lives in Eagle River, which is about 20 miles by bike trail from my home in Anchorage. On Saturday, October 5 we agreed on a plan where Ted would head towards Anchorage, I would head towards Eagle River. After meeting on the bike path somewhere in the middle, he would turn around and we would head back up to Eagle River for coffee. The plan worked great. I enjoyed a fine coffee with Ted at Jitters in Eagle River, and we got to trade stories from our respective big summer rides. 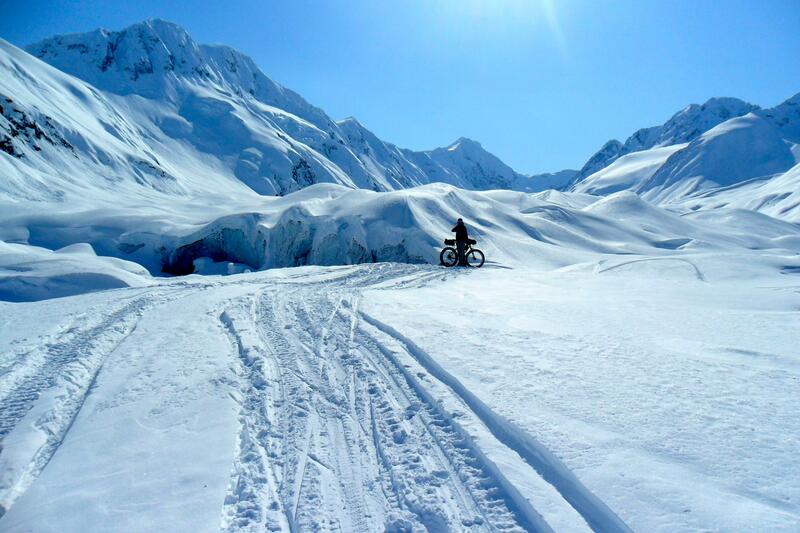 Ted had done the Alaskan 1200k, the Big Wild Ride, this summer. I then hit the trail back home for a round trip of about 40 miles. My longest ride since LEL ended in early August. Things got a little soggy on the way back, but it was good to be out riding. You can see the empty computer bracket on my bike there. The following weekend, on October 12, I met Ted for coffee again. 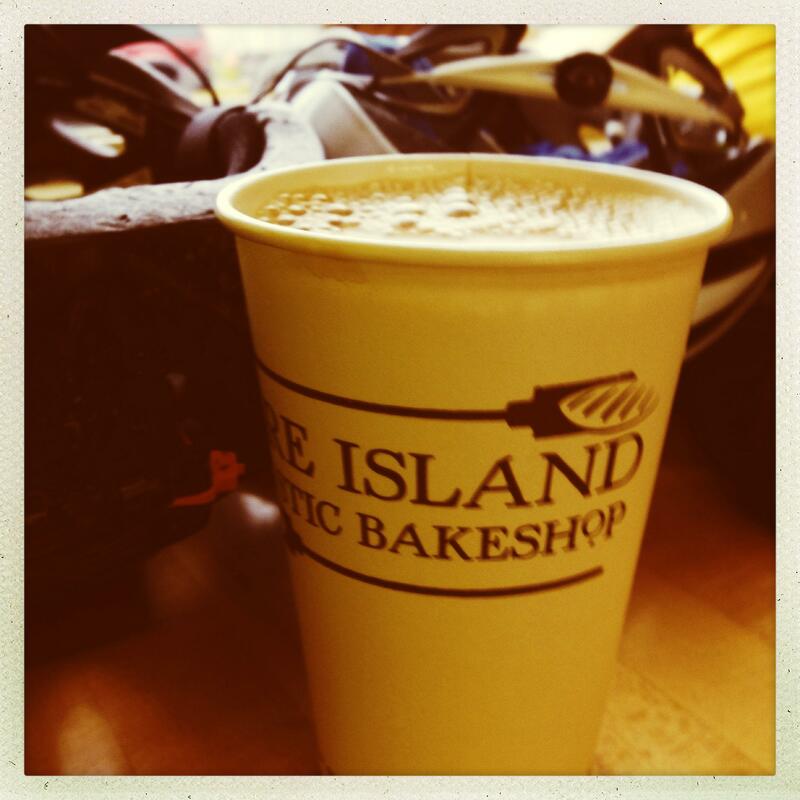 We had similar plan, but after meeting in the middle between Eagle River and Anchorage, we headed back towards Anchorage for another excellent cup of coffee at the Fire Island Bakeshop. Coffeeneuring Ride #3. Alaska Day. This one bent the rules a little bit. Friday, October 11 was Alaska Day—- a state holiday and I am a state worker. I know it is not technically a weekend, and not my regular day off either, but putting in a ride still seemed well within the spirit of the endeavor. Even though it was a day off I had to head into the office to finish up a few things, so I road the Coastal Trail downtown and stopped at Side Street Espresso for a latte before heading into the office. George, the owner and for reasons too numerous to go into here a generally amazing human being, even put a “T” in the foam for me (Tom). Normally I am only drink black coffee, but I thought I would give the latte a try. I decided I preferred the plain stuff. After a few hours of work I headed home. Total distance was about 6 miles. This was a special ride. 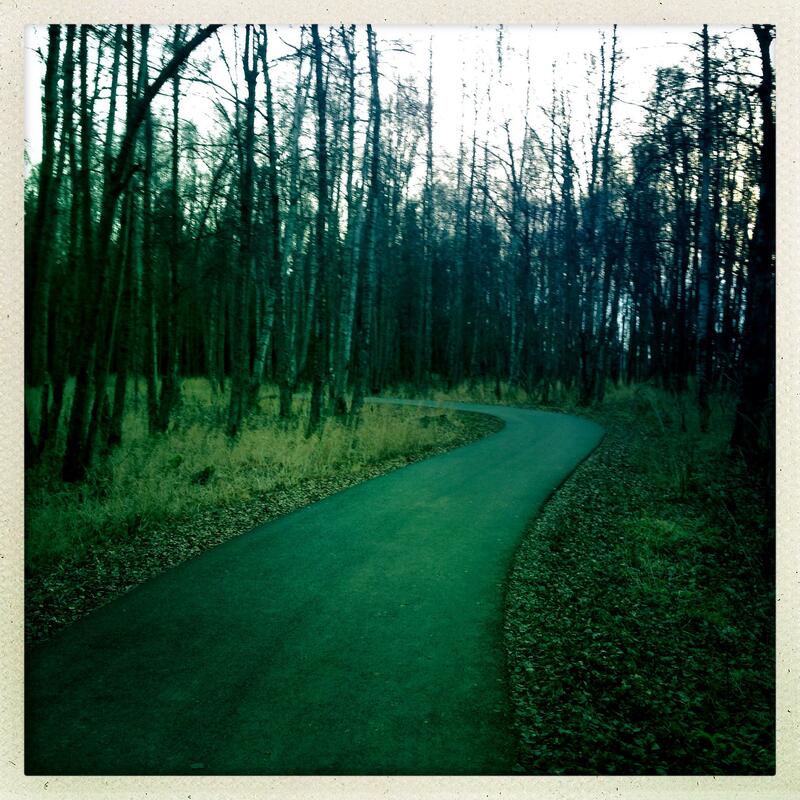 Anchorage is not otherwise a model of urban planning and design, but the one thing we do have here is a fantastic network of paved bike trails all through the city. Beautiful, scenic trails along the ocean and creekbeds throughout town. For years though, one link has been missing. The Campbell Creek Trail which runs diagonally most the way across town from the Northeast corner to the Southwest (or I guess, Southwest to Northeast, depending on which way you are going) was bisected by a major highway, with no practical way to get across. It continued on both sides of the highway, but you could not get across without a major detour on busy and dangerous streets. Finally, the weekend of October 12, the connection was made underneath the highway and a new way across town by bike opened up. It now makes for a great loop around town connecting the Campbell Creek Trail, various trails, with only a few, not unpleasant on road segments. I rode the half mile from my house to the Coastal Trail at Lyn Ary Park, took the Chester Creek Trail out to Elmore, got on the Campbell Creek trail to 88th, took some streets to reconnect with the trail along Sand Lake, and from there into Kincaid Park and back on the Coastal Trail to home. About 30 miles total. 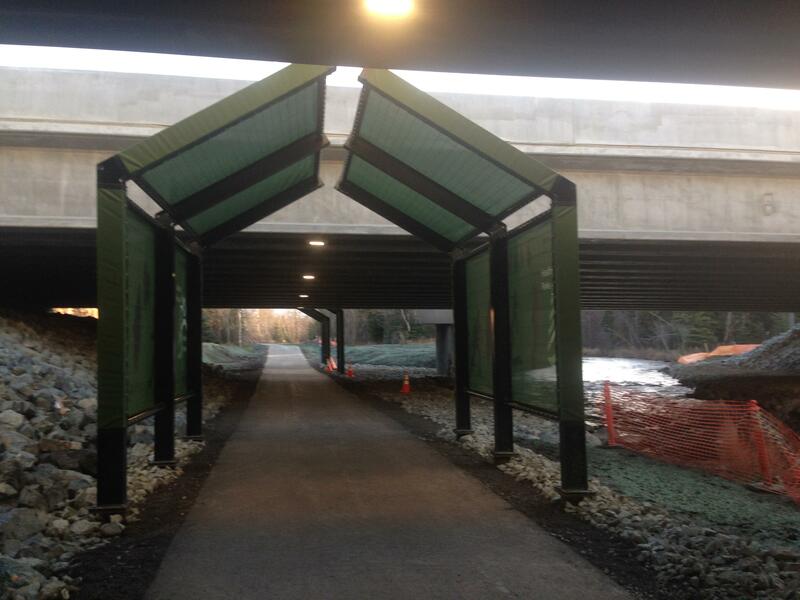 Here is the new segment under the highway. The metal things are to protect the trail and people from snow thrown by snowplows over the side of the highway. Oh, and I stopped at one of Anchorage’s ubiquitous roadside coffee shacks for a truly vile and bitter cup of some sort of black sludge. Still, I was extraordinarily pleased with the whole ride. The following weekend, October 20, our beautiful (for us) fall weather had still not morphed into winter yet, and I decided that I should get out for at least one more pavement ride. I took the Coastal Trail (which had been closed for much of the summer for repaving) from my house down to Kincaid Park and out to Kaladi Brothers Coffee on Jewel Lake and Raspberry for a fine espresso, and wound my way home through the streets. Kaladi, a local roaster and chain makes excellent coffee. 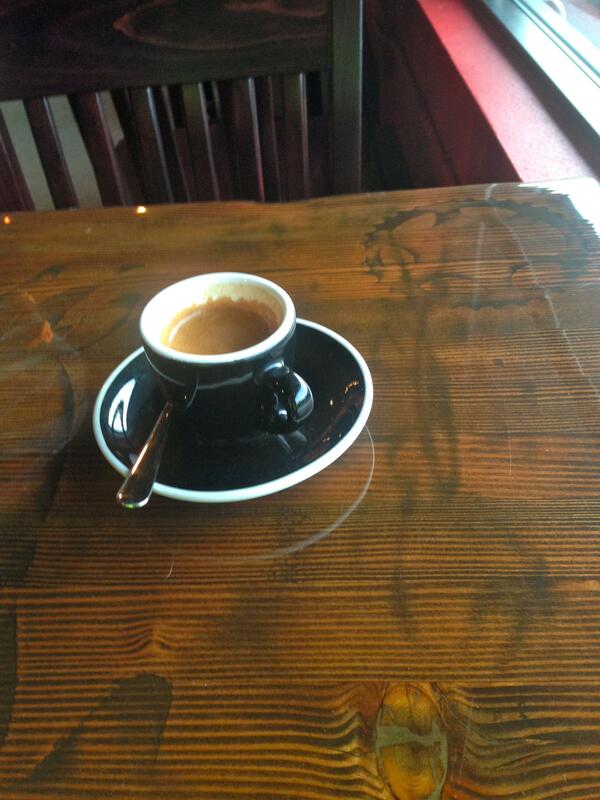 Note the chain ring burn in the table top. Total distance was about 15-20 miles. 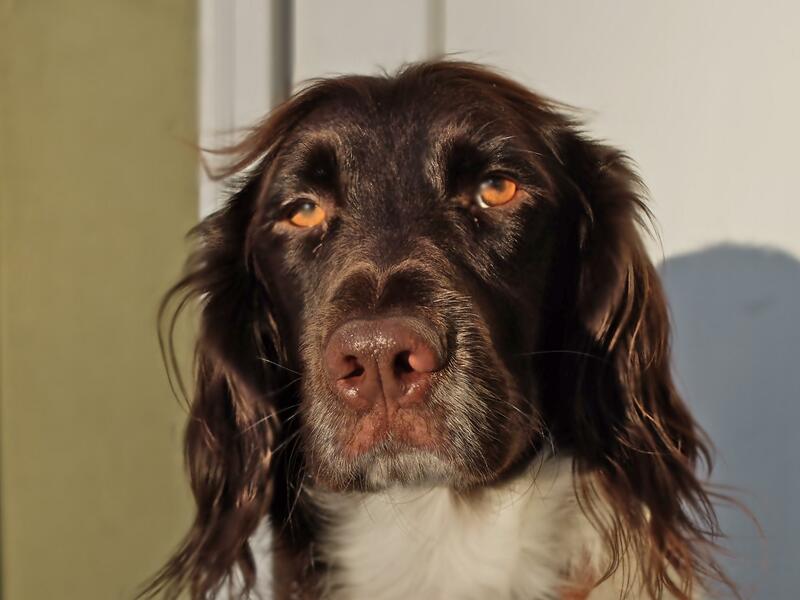 Before we get to ride #6, I need to insert a picture of Django, our Small Munsterlander, and the finest four-legged beast there ever was. Just because I feel like it. He turned two on Veteran’s day and this is the birthday portrait I took. I decided to make some modifications to my fatbike (note: the general type of bike is a fatbike, the particular brand I own is a Fatback) this year. I put on new, wider handlebars–Jones loop bars. Not only are they wider, the loop part gives lots of extra real estate for lights and accessories, which had always been crowded out by pogies before. But, my cables were now just a bit too short, and I could not turn the bars fully. On Saturday, November 2, I hopped on the bike and rode 1.4 miles to Speedway Cycles, and asked them to replace the cables. I checked the mileage on Google maps to make sure the round trip would be a full two miles. I had hoped to get a coffee while they worked on my bike and then ride home, but they said I would have to wait until Tuesday to pick it up. So, much to the confusion of the mechanic, I said fine, but I needed to go ride around for a bit first. I rode around for what I estimated to be at least ¾ a mile, then brought the bike back to the shop. I dropped it off and went across the street to the Kaladi Brothers there (different shop from the last ride), had yet another excellent coffee, and then just walked home. Unfortunately my phone battery died, so I don’t have a picture from this ride. But, if you look carefully in the picture from ride #7, you can see the little claim tag Speedway put in front wheel. Not much evidence of the ride, but it will have to do. Winter finally arrived in Anchorage this weekend. On Sunday November 10th we got snow, and to celebrate I took the fatbike down the Coastal Trail, through about five inches of snow, and into downtown. The only place I could find that was open at 5:00 on a Sunday evening was the Starbucks near town square. 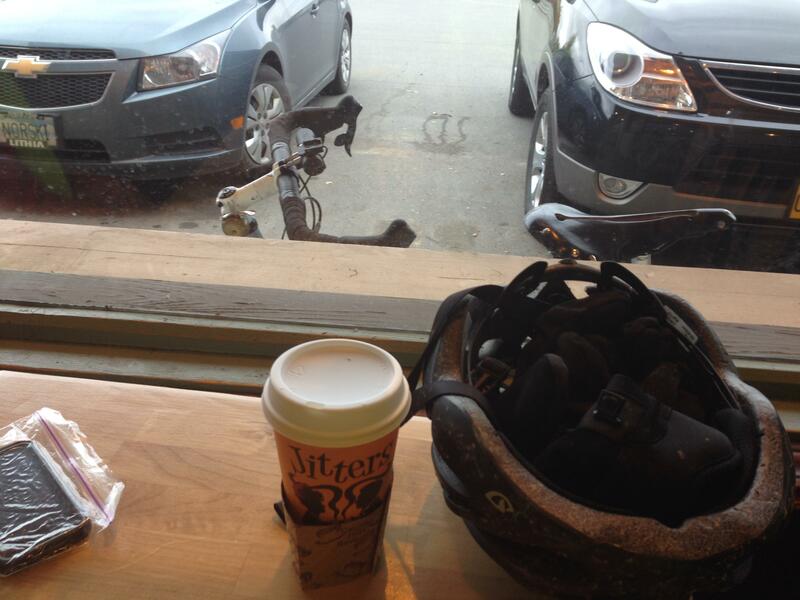 I got my coffee, and contemplated the end of my biggest summer of riding. Three 200Ks, a 300K, (I missed the 400K) my first 600K, the 1400K LEL, and lots of other shorter rides. 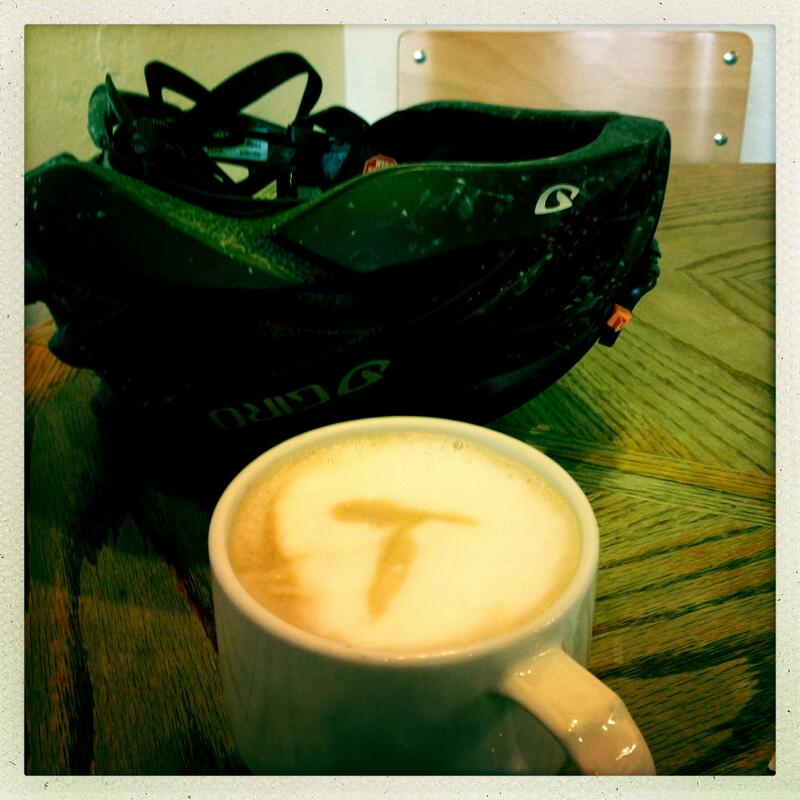 What a great year you’ve had, Tom, and I’m so glad that you made the Coffeeneuring Challenge part of it. 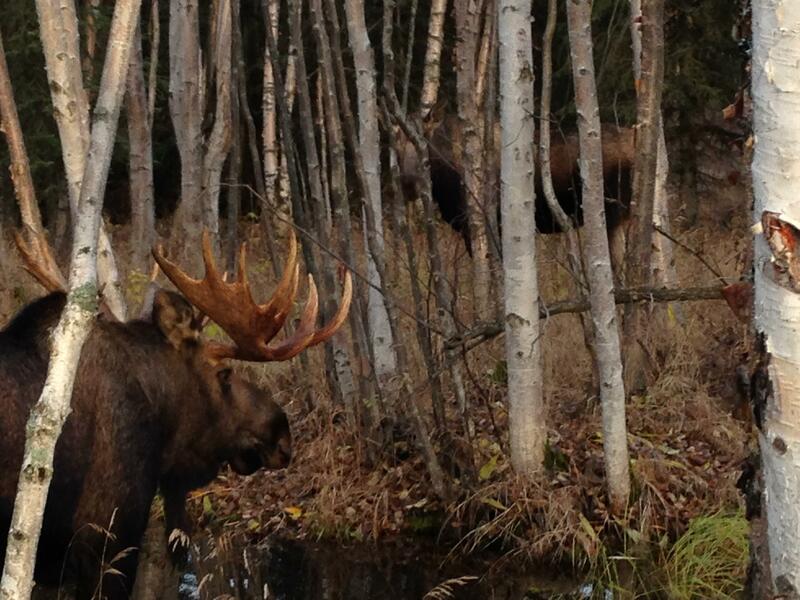 Thanks for sharing your corner of Alaska with us! 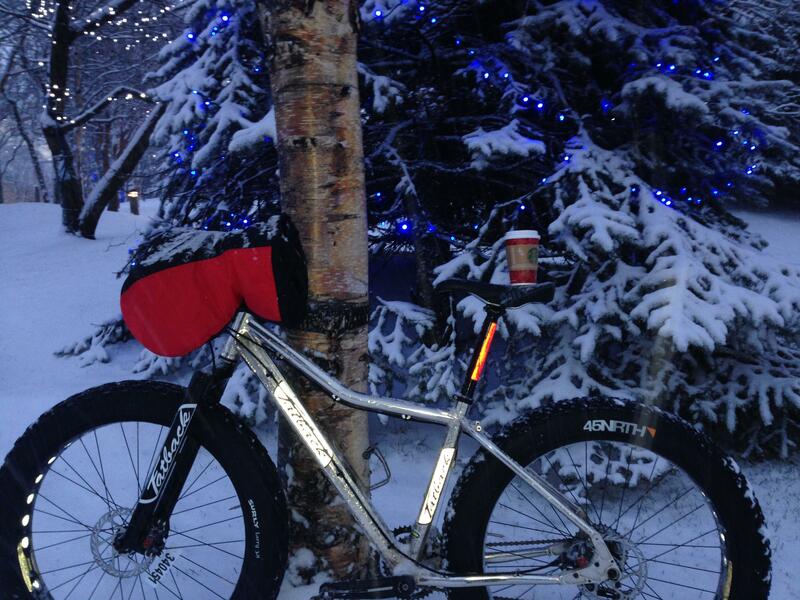 The first photo of the fat bike with the mountains in the background makes me so jealous! My area of the country is just plain FLAT and boring (but we do have a lot of snow on the ground).